As I didn’t get chance to play enough games to write a review this week I thought I do a little ruminating on a little known rule that exists in most games. The ABC rule simply stands for Anyone But Chris. This rule states that it doesn’t matter who wins, as long as I don't win. In some games this rule does not really apply. For example, Agricola or Thunderstone where they player interaction is generally minimal and rarely targets a specific player. Also in all 2 player games where there is no other player to target. However, in most other games the ABC rule can come into play. What does this do to the balance of the game? The ABC rule can already have a built in balance mechanic. For example, Munchkin assumes that the other players will attempt to bring you down if you are about to win and gives you plenty of ways to ensure that you can overcome them. In a lot of cases players who are targeted by the ABC rule are conceived to be the best or most experienced player at the table. If this is true then having the other players team up to take you down is only natural. In which case you will play the game accordingly, you are forced to adopt a strong strategy that will allow you to weather the damage the other players will throw your way. This could mean that you will need to horde cards that cancel nasty effects, or that will help you recover in some way. Or perhaps you will use the early stages of the game to build up a good defence, or an excellent goods engine that will help you cope better when the other players decide to gun for you. It is possible to try and overcome the disadvantage of the ABC using logic or playing openly. For example, in Settlers of Catan, if you choose not to buy Development cards then all of your points can be clearly seen on the table, this, in theory, will prove to the other players that you are not in fact a danger and they should target the robber at another players land. An unfortunate side effect of the ABC rule is that any advice you give is automatically suspect and so players will assume that they are playing to fulfil your agenda if they follow your advice. In some games the ABC rule is simply a death sentence, sometime literally. Games that include traitors, for example Werewolf, Saboteur and Battlestar can begin with you being lynched, sabotaged or brigged “just to make sure”. And with the addition of the Pegasus expansion you could even be airlocked! In games that require negation or trading, such as Cosmic Encounter, you could easily find that players will refuse to ally with you, because it helps you win, even if there are clear advantages to doing so. But finally, possibly the worst thing that can happen is the “I’m only playing for second” caveat. For example, in a recent three player game of Nightfall, one player was behind by a long way, I was pretty bad off too and the other player had at most 4 wounds. This information was not hidden, the losing player knew everything and yet the player chose to attack me, instead of the winner because she might still get second. Of course, as we all know second counts for nothing! Are there games that people refuse to play with you because of your perceived advantages? Have your potential victories been cruelly dismantled because, by luck, you won the first ever game and then bragged about how awesome you are? If so, then you’ve probably been a victim of the ABC rule too! What experiences have you guys had with this most heinous of house rules? Continuing our adventures into the world of Cooperative gaming the next game I introduced to my fledgling group of non-gamers was Mysterium. 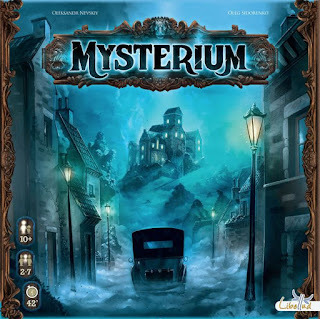 Mysterium takes the game of Clue and replaces the concept of logic and reasoning with an obtuse ghost, through which your group of mediums is attempting to deduce the ghosts killer. Rather than simply explain it was the Reverend Green, with the Candlestick in the Dining Room, the ghost will first tell you it’s entire life story, including every character he met along the way before his untimely demise. Finally, from this rogues gallery you must choose who you think was the killer based on yet more interpretive dreams given to you by the world's worst eye witness… seriously, it’s like he doesn’t even want you to catch his killer! So, it’s expansion time again and this week I’m going to talk about Eternal Winter, an expansion for the D&D Fantasy Board Game I reviewed last week. I’m going to focus this review primarily on what the expansion adds rather than on specific cards etc.